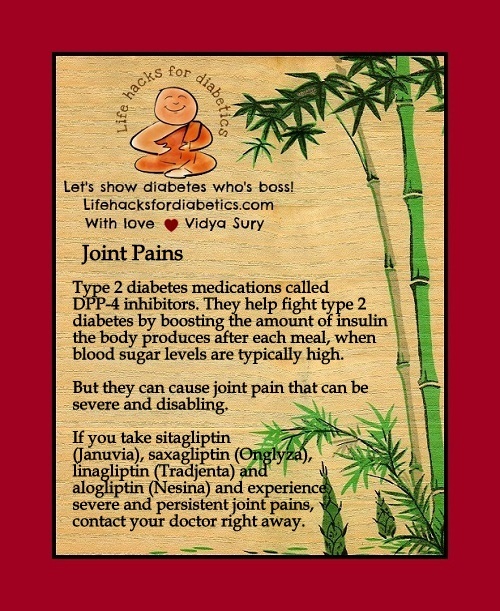 Type 2 diabetes medications called DPP-4 inhibitors help fight type 2 diabetes by boosting the amount of insulin the body produces after each meal, when blood sugar levels are typically high. But they can cause joint pain that can be severe and disabling. If you take sitagliptin (Januvia), saxagliptin (Onglyza), linagliptin (Tradjenta) and alogliptin (Nesina) and experience severe and persistent joint pains, contact your doctor right away.